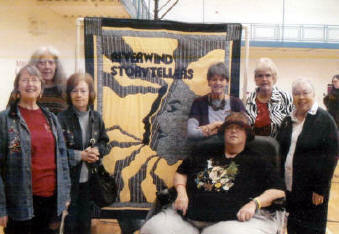 The Riverwind Storytellers are a group of storytellers from many walks of life. The group started meeting in 1983, after several members attended the National Storytelling Festival in Jonesborough, TN. They currently meet once a month at 6:00 pm (dinner at 6:30 pm) at a local restaurant. During supper they discuss the what and where of storytelling. Then, they sit back to listen to each other tell a tale. They encourage seasoned tellers, listeners, and newbie storytellers to join them. Read more about the history of Riverwind by clicking HERE. Once a year they hold "The Riverwind Whirlwind Weekend." 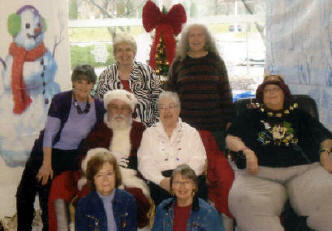 In the past they have had many talented, master storytellers as their workshop leaders. During the year they tell at a variety of events - First Night at the Lewis and Clark College, Belleville's Art on the Square, Family Reading Nights, the Edwardsville Library's "Witches' Brew," "Spooks and Sparks" at the Haynor Library in Alton, and others. For more information on the Riverwind Storytellers, you can contact the officers by clicking on the e-addresses above. The Golden Corral, off Rt. 157, in Collinsville, (across from Walgreens). Since there are occasional conflicts, please contact our President Lynne Beetner (lynnebeetner@yahoo.com)for an update on where the meeting will be held. After a short business meeting about what is going on in the storytelling world, Riverwind settles in to share a tale or two or three... Listeners and Tellers are welcome to attend. Ten Good Reasons to Belong to Riverwind.